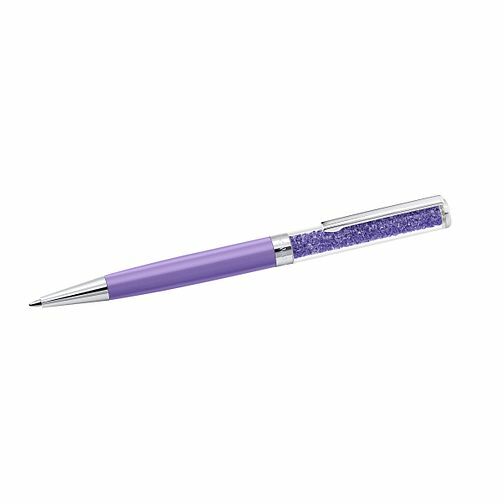 Let your creative flair stand out with a vivid purple pen from Swarovski, with their signature crystals embellishing the pen to create a lovely and colourful sparkle. Experience a wide range of luxury Swarovski designs, made with their signature glittering crystals. Swarovski Crystalline Purple Ballpoint Pen is rated 5.0 out of 5 by 1. Rated 5 out of 5 by Anonymous from Lovely Pen This is a very good quality pen.Writes very well although the refills are small & so do not last very long.But you can buy the refills online D1.The pen is very attractive & has a lovely weight & feel to it.I would recommend this to anyone who enjoys writing.